We show how our new dataset, RavenPack Analytics (RPA), improves the predictive power of our models by taking advantage of our new analytics. In this first research on the new RavenPack Analytics (RPA), we take advantage of the latest innovations in natural language processing, which provide a much deeper textual analysis of unstructured documents. RPA is our latest dataset powering our new self-service data and visualization platform. Where you get your news from has never mattered more than today. Whether it’s the information people digest when casting their vote or investors use to make business decisions; source, quality, and timeliness matter. For investors, news is available instantly via a multitude of media formats from real-time newswires to social media. Everything from economic forecasts to merger and acquisitions rumors travels, quite literally, at the speed of light, impacting asset prices within milliseconds. Nowhere is trusted and relevant news more important than in the financial industry. Analyzing and understanding news in a timely and accurate manner can have a major impact on your investment returns. Hence, it is important to be able to track such information across your entire portfolio with data that offers both high precision and high recall. High precision data yields stronger signals and limits the noise that feeds into our modelling process, while high recall ensures that we capture as many news events as possible that could impact our portfolio, preventing us from being caught on the wrong side of the market. 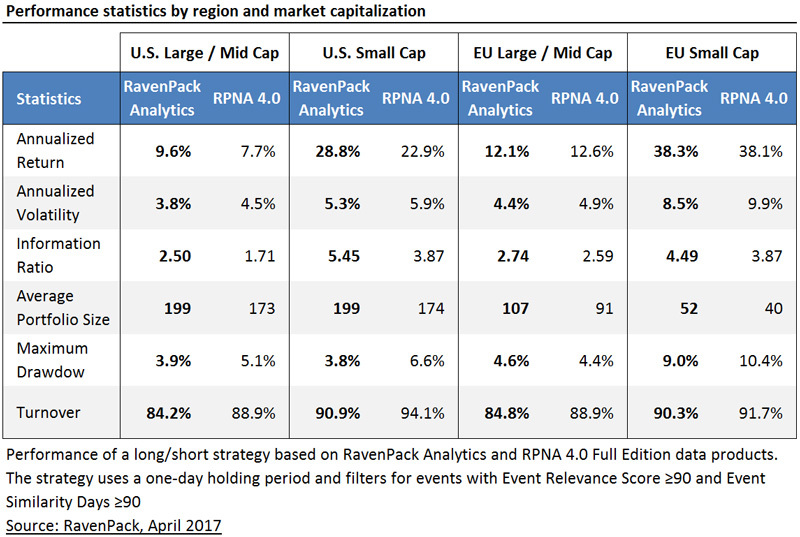 Click here to continue reading the "RavenPack Analytics For Equity Trading"